Choosing safety airline companies, finding non-expensive and convenient flights, booking tickets online is easy when you perform it on a well-constructed site. To set up the one that will provide its visitors with fast and easy way of receiving the needed information, try this professional design. It makes use of well-arranged content blocks to acquaint people with popular destinations, flight info, charters, and intuitive navigation to make the work with the site comfortable. 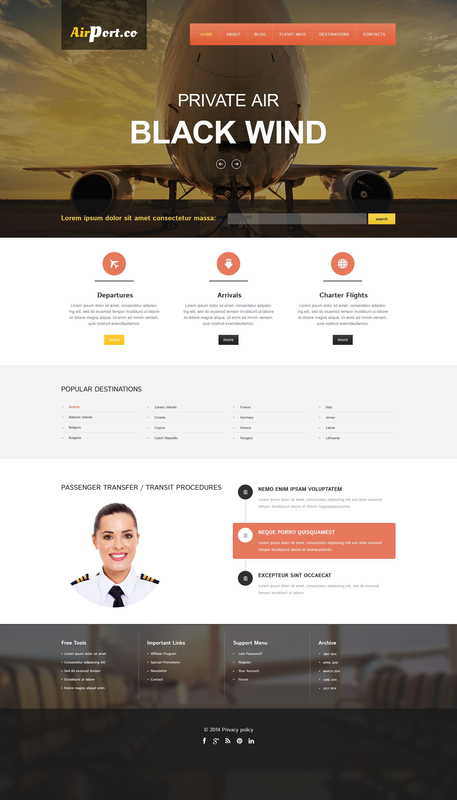 Contemporary look and user-friendliness of this theme turn it into a perfect fit for presenting airline company online.